AMDJ Quad Gem is like 4 lights all in one! 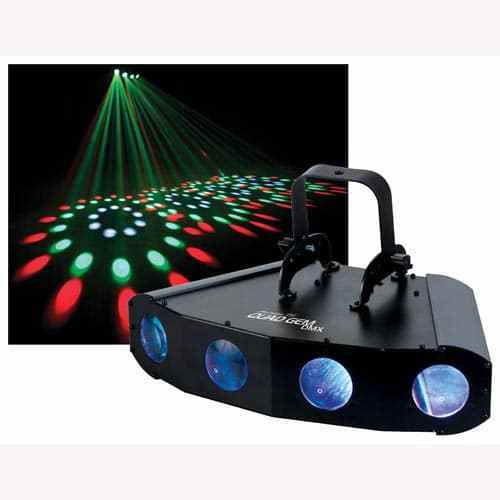 Super fun party light system that provides an extra large coverage area with moonflower patterns. This light creates playful patterns and colorful shapes that dance across the floor in Red, Green and Blue. This light will transform your event space into a veritable night club. Dance all night long in the lime-lights, red-lights and blue-lights under the Quad Gem. It doesn’t have to be Saturday night to enjoy a memorable party with your friends and guests, rent the Quad Gem today – yolo! *All lighting requires installation and may require trusses and/or lighting tripods. **Notes: this rental requires power, plan accordingly.